Teaching your kids to do something well is hard. We can all teach any kid an intro to _____ball, the basics to good manners, and the cliff notes to the birds and the bees. But really diving in and fully explaining, demonstrating, practicing, checking, correcting, and practicing some more is a beat down…for the parent and the child alike. It’s worth the investment, though, as learning to do something really well, outside of sports, academics, and the arts, seems to be a dying art for kids these days. Investing time to instruct my children how to do things really well not only helps teach my kids to take ownership of their work, but it also helps them separate themselves from the herd by mastering what used to be called basic human necessity: taking care of yourself, earning a living, keeping house, and managing money. All or nothing is my motto, so teaching moments with my kids are pretty intense. It’s hard for them and hard for me. Today was housecleaning. They’ve been involved for years with picking up after themselves, clearing dishes, and doing housework chores here and there. But today, we stepped it up a notch. With a new Family Economy in place where the girls are responsible for earning their own money for their wants and needs, such as clothes, entertainment, toys, events, etc. 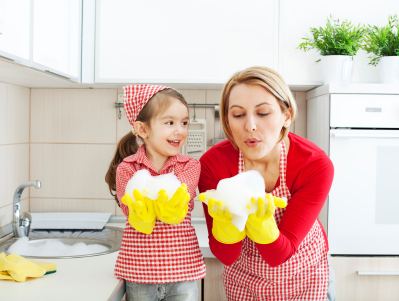 by completing their daily personal and household tasks, my kids have an opportunity to earn bonus money for the chores typically deemed a pain in the you-know-what, which are typically performed by you-know-who. My eldest was looking to make up for some missed earning opportunities during her week, so she offered to help me with the housecleaning. Sound like a win-win, right? I get help with the dreaded cleaning and she earns some extra cash. Not so fast. Sure, she’d dusted some furniture before, moved a mop over the kitchen floors, and even introduced herself to a toilet brush a few weeks back . But to complete a cleaning task to the level that doesn’t require a re-touch or re-do from another person, a.k.a. me, requires a strategy. Strategies take thought and experience and planning, all which require time, and in some cases, input from others. The sweeping of the basement went off without a hitch. Location of vacuum? Check. Rooms to sweep? Check. Attachments to use? Check. She vacuumed the whole basement in under 20 minutes before carefully drawing up the cord of the machine and putting it away. She forgot the downstairs bathroom, so she used her noggin and grabbed the portable, battery-opertated vacuum from upstairs to do that small area instead of hauling out the heavy, old-school vacuum that needed to be unspooled and plugged in. Next came the feat of cleaning the basement half bathroom. Rarely used, it is an easy room to keep tidy. But to a 9-year-old, it still seemed daunting. Together we went through the steps of cleaning….mirror first, then sink, then tank of commode, with toilet bowl last. I explained the reason for the order (so you could use the same cleaning rag for all surfaces) and which product to use that would accommodate all surfaces. She did a great job….both efficient and clean. The final chore was the upstairs full bathroom. She knew it was a big job, but wanted the big payoff ($3). Using the same concept as the basement bathroom, we incorporated the tub, the tile floors, and the free-standing cabinet into the cleaning equation. She asked me for help with how to get the dirt off, where to stand to reach the mirror, and what to take off of the sink, cabinet, and tub, before cleaning it. All in all, it took her almost an hour and a half to clean that room alone. It was sparkling. She was proud of herself and happy to earn her bonus chore money. Six hours into a four-hour housecleaning job, I was exhausted and my temper was short, as not only was I trying to clean one floor of the house in its entirety, but also trying to instruct my 4-year-old how to clean windows and mirrors to the point of no smudges, while simultaneously helping my older daughter navigate the bathrooms. It was an important day for all of us. Each of my kids learned how to do a common task well. I didn’t pay for a piano instructor to teach them to play notes or rely on a professional teacher to help them learn to read. I taught them myself how to do something elementary - clean well - and they learned. They taught me to do something elementary - be patient and give them the time they needed from me - blow the schedule and the tasks and just live in the moment for once. We took a break to practice shoe-tying when my 4-year-old needed a break. We worked together as a team. We all got frustrated at times, but we forged ahead and finished our work so we could relax and play later. If you’d ask my kids tomorrow if they’d rather take a turn on the tire swing or clean the house again and earn extra money, the tire swing will win out every time. But in talking about the experience afterwards, they both reminded me that we had fun too. We listened to loud music and danced while we cleaned and felt proud when we accomplished our goals. We really felt like we deserved our bike ride in the late afternoon. I could go on and on about parenting today and the lack of expectation we hold for our children when it comes to contributing to the household or even contributing to their own well-being, but to be honest, I’m more concerned with my own kids learning how to learn, and even more importantly, instilling in themselves the desire to do for themselves, than I am for society at large. My daughter knows how to keep her own house clean, and if need or want be, how to make a living by keeping other people’s houses clean. I’m a proud mama.